Looking for the ‘Our Best Bites’ Cookbook giveaway? Scroll down or click here for details. And then click here to enter into the overflow section……because the first post reached its maximum comment allowance. Good luck! I am always looking for ways to use up and re-purpose those old shirts in the closet. But this time, I saw some knit shirts at Old Navy in the Women’s section that were about $2 on clearance. (Buy the biggest sizes they have to get the most fabric.) The fabric was a nice and light knit and they came in a variety of colors and prints……….making the perfect fabric for a little springy/summery skirt. $2 plus a little adjusting? Perfect. So keep that in mind while browsing the racks at the store. Sometimes it’s hard to find a great knit at the fabric store for cheap…….so look at those discounted clothes on the clothing racks. And because the bottom seam was already there……all I needed to do was put in a waistband. And what is more comfy than a Yoga style waist band? Nothing. The tall waistband is folded over for a comfy fit. and enjoying the nice weather. Wear it with or without leggings (especially if your little girl insists on a skirt each day)……any time of year. As noted above, I bought this shirt for $2 on the clearance rack at Old Navy. But dig through those closets and see what you already have on hand. Depending on what size you’re making, cut the bottom section of the shirt off. This will be the main section of the skirt. And remember, the bottom hem of the shirt will be the new bottom hem of the skirt……so don’t cut it off. My little girl wears about a 4T in skirts, so I measured 9 inches up from the bottom of the shirt and cut it off. Then, if you have enough fabric left on the shirt cut out a piece that’s big enough for the yoga band. Mine came from the back of the shirt. (If not, use some fabric from a different shirt or some knit fabric from your scrap pile.) My waist band piece was 20 inches wide x 9 inches tall……..but if I had more fabric, I would have made it about 20 x 11 inches. Just to give the waistband more height. Because I love an even taller/adjustable waist band. Then turn your tube right side out and fold the tube down inside itself in half, keeping the right side of the fabric on the outside. Then gather up the top raw edge of the bottom section of the skirt. Make your basting stitch about 1/2 inch from the top. (Need help with gathering? Click here.) Gather in the skirt so that it’s the same width as your band that you just folded in half. Fold the band down over the top of the gathered section and pin this section evenly in place. Don’t stretch it as you’re pinning. Make sure you are pinning the raw edge of the skirt with the 2 raw edges of the folded band. The actual fold of the band is at the other end of the band……….shown in the upper left side of the image below. Now, serge or zig-zag those layers together (3 layers in all), using a 1/2 inch seam allowance…….all the way around the skirt. If your basting stitch happens to be showing, pull on those threads to remove them. Very few steps…….with lovely results. « A Delicious Giveaway for 3…….well, delicious if you use your winnings! Wow, this is so simple and so cute! Thanks! You need to stop making everything look so simple! Now I'll have to go through all my old shirts and make skirts galore for my little girls! now i just have to have girls. there's only so much fabric i can buy for my 8+ nieces (without my husband getting mad) and my boys always ask me why i'm making so many skirts!! cute skirt…i'm sure i'll be making one for my nieces this summer!! So cute! Makes me wish I had a girl to make some of these for! That is so cute! I love your tutorials, they are all ways full of photos and very clear directions. Love love love it! Will definitely be making at least one or two of these with my huge stash! Awesome idea, perfect for the upcoming spring weather!! where do you get your daughter's leggings? Glad you guys like this one. And I promise…..it's a quick and satisfying project. And Cortney, I bought those leggings at Old Navy. I usually get her leggings at Old Navy and Target. They seem to have the most colors and styles. Or I have made a few myself. Good luck! I love the skirt. I also noticed her cute leggings, did you make those? so cuuute! i love that your tutorials are always so easy! thanx for sharing ashley! You are brilliant. I wish I had even basic sewing skills. I have a machine, but can't do more than a straight stich. I may have to get brave and try this. I wish I had a girl to make all these cute things for! Love that shirt as a skirt! Great tutorial. Thank you so much! This is something easy peasy I can make for my twin granddaughters. That turned out crazy cute. I love it! Thanks for sharing. I wish I could figure out how to do this for adults!! LOVE LOVE LOVE it! And SO easy!!! Thanks! I love it! now I need to go buy some clearance t's! Me fascina todo lo que haces Ashley! Eres mi ejemplo a seguír! Gracias por los tutoriales! Tu niña es preciosa! THis is very cute! I wish my daughter was still small enough for me to be able to make things like this for her. I love your creativity! I've tried to make myself a similar skirt and I had the hardest time getting the waist band to fit right. I was worried about it being to small… it ended up too big and falling down. Tami…..ha, I'm with you on being an avid clearance shopper. Atta girl! And as for an adult version……I actually made one of those too and will show pics later on this week. Stay tuned! I love the feel of knits fabric. You just can't go wrong with it when it comes to kids and being comfy! Do you know of any good tutorials/patterns for making leggings? I love this! I'm kind of obsessed with finding new things to make with old t-shirts and this is perfect! love it!!!! will have to go thru my tub of clothes and give this one a go!!! Such a great idea! My girlie needs a few more springy skirts and this is definitely going on my "to sew" list. Cute skirt… but I really, really want to know where you got those adorable light yellow leggings! This is fabulous and so simple! I never would have thought to do this. I off to raid my closet and plan to make some of these for my granddaughter. Thanks so much for the tutorial and most of all for the idea. This is too cute! and why I always compliment you and your tutes. So cute! I cannot believe that it was a shirt before. Simply marvelous! I love the pink shoes — where did you get these? oh my!!! I'm off to clean out my closets!!! that is the cutest skirt…so twirly and pretty! I just made two of these yesterday in about 2hrs!!! ( would have been faster had I read the directions better!) Thanks so, so much Ashley! Yes to infinity, please to infinity. Would love to be in the know! The leggings were from Old Navy…..and the shoes are puddle jumpers shoes. They were hand-me-downs from a friend…..and we love them! Thanks for another lovely tutorial! I just saw your comment on my blog and answered it on my blog…but I also wanted to come on over to your space…and I've been here before! I know that I followed a link to a link to a link one time and visited your blog. You really do share some great things. In fact, I want this skirt, this very skirt in my size! AWESOME. Saw this yesterday and whipped it up this morning! too easy and cute- although next time I'll make my waist band smaller- it has more stretch to it than I though it would! so cute!!! I have made a few myself!! So easy. Thank you for this. My 11 year old daughter was looking for something to sew and made this out of an old long pjs. It was easy and explained it all great for her. Again, filing away for when I have a girl! Ashley, I know this is bad timing because you just had your baby, but I'm planning on getting pregnant again soon and have been contemplating making regular pants into maternity pants. I was thinking that doing something like this, attaching a tall, stretchy waistband with some thick elastic in it to the (cut-off?) top of regular jeans or pants might work. But I'm not good at figuring things out like you are. Would you like to figure it out for me? :) Anyway, if you have any advice, I would sure appreciate it! And thank you for the post about maternity bands, I'm excited about making some soon! AND CONGRATULATIONS on your sweet baby! I just made one- from a dollar store shirt! They actually had some with that nice soft knit in some solid colors- I got a vibrant turquoise mens XL. Thanks for the easy tutorial- you are totally helping me improve my sewing skills! following your blog for a while now… Love it! you are quite an inspiration. oh my goodness!!! I am going to make my daughter and my niece one of these!! I love everything about this and want to make 5 or 15 of them. Any chance you can do a tutorial on how to decide the measurements for older/younger children? Or maybe you can point me to the right place if you've already done so. I love it! Especially the yoga waist band, they are my favorite of all time and so comfortable. want to say thank you for the tutorial. I bought myself a tshirt few weeks back got home tried it on and it was too small.. i was thinking well i could just put it in an opshop bag and then i remembered this tutorial. I did sacrifice another old tshirt for the waist band as i needed more length for my tall girl. I am ever so proud of myself for actually making my beautiful girl a skirt as normally im a straight stitch sewer and i managed to work with knits!! This is genius! I'm making this for sure (maybe for ME)! Great Tip: I got a turtleneck shirt from Old Navy clearance rack today for 75 cents. I used the neck part of the shirt for the waistband so it was already made. I just had to cut off the bottom of the shirt, gather it, and sew it together. So simple. 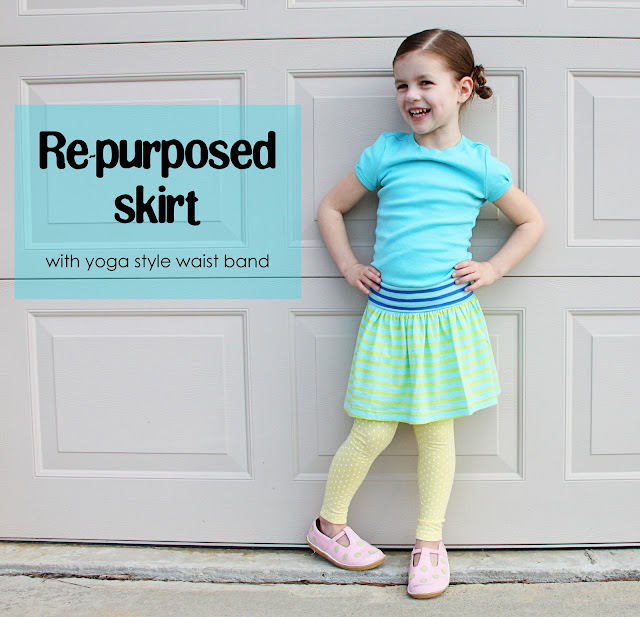 My girls love the skirt I made from this tutorial!!!! Brilliant! So simple and a great way to get bargain stretch fabric, which believe me is hard to find. I’ll be trawling through those sale bins/racks from now on. Thanks for the idea. And a gorgeous skirt too – think my daughter will be getting a new skirt soon! Thanks for this tutorial! I know it was a posted a long time ago, but I have been saving it for when I got a sewing machine, and that was today! I just made a cute shirt for my little 4T and can’t wait for her to wake up from a nap and try it on. Thanks for all the advice – i love your blog! Cute skirt – not shirt as I mentioned earlier. Did you dye the shirt blue? In the first few pictures it looks like the lighter stripes are cream, but it’s very blue in the rest of the pictures. If you did dye it, that’s brilliant! lol I can’t look at fabric and picture it as anything but how it comes to me. I really hope that I can develop that when I get a little more experience, because I am just starting out and I’ve made 3 of your projects already and tried others, but yours are the only one’s I’ve been successful at. Happened to be strolling through the internet and found this wonderful site. I loved his work and like you, I love to customize clothes for my children. I live in Brazil and was looking for exactly what I found here. I absolutely love this! I have so many t-shirts lying around that I could do something like this with…or make a fun trip to the thrift store to pick out some stripes! Hey, thanks so much for sharing your creativity. I did it!! Thank you. This inspired a lovely twist: a tie-dyed shirt provided the skirt, and the solid dark blue provided the waist, which also got a couple decorative buttons. Even made a matching hat out the remnants. ?? if you don’t stretch the knit as you sew, how do you keep your thread from breaking when it is finished and the knit stretches? Great ideas! LOVE ALL THE RE-PURPOSING!